There said to be about 2,500 lightning strikes to the Earth surface in every second and tendency of lightning hitting a person is one in six hundred thousand. People use an increasing amount of sophisticated electronics equipments resulting from the advancement of science and technology. The same advancement inherited us with deforestation, high-rising buildings and drastic environmental impact that make the planet earth hotter every day and that makes it more vulnerable for lightning affects. This compelled engineers and technologists to put their minds together and find a way out of the impending danger. The solution they had evolved caused far reaching changes in the professions of entrepreneurs, installers and inventors to change all the previously existed standards and called upon them to take extra time to figure out the most suitable technologies to protect people and property in the event of lightning. There are two main standards of lightning protection systems - conventional and non-conventional. The conventional standard includes Curtnary wire, Faraday cage, Ring Conductors, and Finials etc. combined with down line lightning standards. The non-conventional standards consist of enhanced protection radius with inclusion of passive or active elements (ESE) combined with down line lightning protection standards and hybrid system which contains indigenous technologies that have been used along with modern theories. Despite reservations and criticisms from scientific minds of several European nations on the unorthodox technologies used in the non-conventional standards, the trend is that they are widely employed elsewhere in the world. In Sri Lanka, there is no specific standard when it comes to lightning protection. There are about 10 to 15 foreign brands available here until recent times and most of them came from the Europe. The situation has now changed with the proliferation of cheaper options flooding from China. In comparison of the cost between the conventional standards and nonconventional standards, the latter is very much less expensive. When it comes to talk of methods applied for direct protection from lightning hazard under the conventional system we find Faraday cage (Curtanary wire, ring conductors), array of spikes on the roof with associated down conductors, steel roof and structures themselves used as a down conductor with associated grounding network which is cost effective. There is another cost effective method of using steel flashing and steel gutters as a complementary down conductors with associated direct lighting protection system. The non-conventional or ESE systems have been developed in the Europe where there are so many laboratories to test units of lighting protection system. But they have received heavy flack from some orthodox scientists who do not accept these units claiming that they would not be functional under the real life situations. This while the situation in the world of modern day lightning protection, we in Sri Lanka see that some of our scientists and engineers continue to waste money for spending on copper in devising lightning protective systems. Sadly they continue to do so without testing any other scientifically proven methods or long standing experience in logical outset. We also see some steel roofs too have been recommended to laying the conductors as a dedicated lightning conductor that could be resulting in unnecessary issues of corrosion or side flash effects. Standards should be used as a guide line but not as a methodology. Transgression of this maxim sees there has been abuse of standards recommended to lay ring conductors - if the given location is steel bonded, it is an utter waste of money to lay an additional conductive element). Presently, almost all the buildings are composed with conductive gutters or steel prefabricated buildings. Thus engineers should be extra vigilant in figuring out the solutions in order to economize the project with positive technicality. Carrying out a comprehensive risk assessment prior to selecting a lightning protection scheme has been now accepted as a practice. This could be done by considering the natural fabric of the building or location or Ohmic Resistance Value - number of electrodes to be driven, necessity of ring conductors, local soil conditions, adjoining structures and trees, and the Ufer grounding etc. (The Ufer Ground is an electrical earth grounding method developed during World War II. It uses a concrete-encased electrode to improve grounding in dry areas. The technique is used in construction of concrete foundations.) In selecting a lightning protection it should also be noted that no lightning protection system is 100 percent effective. A system designed in compliance with the standard does not guarantee immunity from damage. Lightning protection is an issue of statistical probabilities and risk management. It is not economically viable to spend the world best system for the protection scheme. What could be advisable is that one should figure out an economically sound system with service back up as an official protection provider. Lightning is a capricious, random and unpredictable event. According to Fundamentals of Lightning published by the National Lightning Safety Institute of the USA its' physical characteristics include current levels sometimes in excess of 400 kA, temperatures to 50,000 degrees F., and speeds approaching one third the speed of light. Globally, some 2,000 on-going thunderstorms cause about 100 lightning strikes to earth each second. Lightning effects can be direct and/or indirect. Direct effects are from resistive (ohmic) heating, arcing and burning. Indirect effects are more probable. They include capacitive, inductive and magnetic behaviour. Lightning "prevention" or "protection" (in an absolute sense) is impossible. 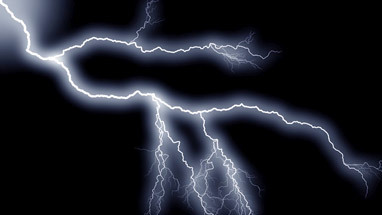 Lightning could strike any given installation and bursts all the connected equipments with direct or indirect effect that has the power of reducing them to ashes in a minute. Right solutions is not be panic or run away but learn to live with danger with the help of technology called power line surge protection systems. Today non-liner arrays are the most common sources of protection widely used such a, MOVs/ZOVs, SAD, capacitors, resistors, electro-static devices and linear filters, inductive dampers, isolation transformers, PTC etc. When selecting a surge protector, it is advisable to refer the limiting voltages/clamping voltages, working voltages, warranty and after sales services need to be verified. All these should be coordinated with local voltages, earthing profiles, equipments capacities, local ionization qualities of the soil etc. However it is sad to say that these requirements are never met by some of foreign brands available. They are highly priced and used only by people who do not have a technical will or those worry of individual perks without national interest to save much needed foreign exchange. Most of the local engineers despite their high awareness on energy armed with analytical skills have become good critics than becoming designers, researchers or developers that they trained to be. That is why our electrical and electronics engineering are said to be about 10 years behind the rest of the world. Hardly anyone develops a local industry. This is amplified by the fact that most of decision makers lack the knowledge of saving foreign exchange by promoting the electrical and electronic engineering field. In the practical scene what we see when looking at domestic installations is the tendency that in most of places, electricians who did the electrical installation, have later become technical consultants. When any related issue arises their employers tend get the electricians advice rather than experts' advice or looking for a proper standard.